For those of you in the NYC area, theres no better way to spend your evening than with some good old noise rock and drone in the form of The Austerity Program, Growing, and Chord, who you may or may not have already heard has some of the fellows from Pelican in its ranks. Its gonna be The Austerity guys first live performance in quite some time, so come out and show them your love. 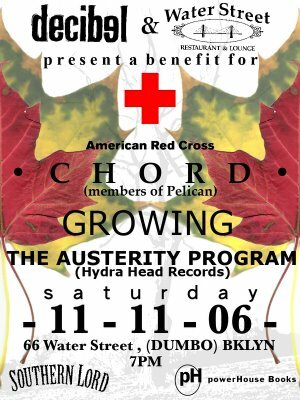 This is also a benefit show for the American Red Cross and there will be prizes and giveaways, so its pretty much a win-win situation for all. While we are on the topic of The Austerity Program, theyve been hard at work on their next release which will see the light of day on HydraHead at some point down the line in 2007. In the mean time check out a trailer for a documentary on the guys and the forthcoming release here and a bit of a teaser posted on the documentary myspace here.